To start, humble apologies for this very delayed post, it has no reflection on the final day at Bioneers. If anything taking it all in was such a wonderful experience that I would encourage all of you to attend a conference or a local beaming Bioneers event one day of you can. This weekend there are five of these events in Boulder, Cleveland, Logan and Salt Lake CIty, and Vancouver. Madison, WI will have theirs in January so you might still be able attend a conference. You can get more information here. The speakers on the final day covered a wide range of material from the power of fund raising to higher education’s embrace of sustainability. In spite of this seemingly diverse subject matter for me they all spoke of the power of transformation. Our increasing interconnectedness provides us an incredible opportunity for personal as well as global transformation. Using our collective ability to dream we can transform globalization into a positive and liberating force for all of us on the planet. If nothing else the climate crises shows how connected we truly are and that solutions must come from every part of the globe. Nina Simons, Bioneers Co-Founder, started the morning with the thought provoking issue of how we reach an agreement when there seem to be two opposing views. This is a most pertinent topic since we see so much divisiveness taking place all around us whether it is on issues of global warming, increased use of renewable energy or our right to buy the food we want to eat. What do we do when it is in everyone’s best interest to come to a resolution, yet we seem so far away from agreement? Nina raised the possibility of enlarging our view of the issue so that in this bigger picture we can find common ground. If we widen our perspective we find a solution, and we learn that in uniting with those who may seem very different we come to a deeper understanding of the issue and equally important of each other. This is precisely what Mary Gonzalez spoke about in her talk on day two when she told us of community efforts to stop an offshore natural gas pipeline in Oxnard, California. It was to be off the coast of a community with a large number of farms and farm workers. By uniting their efforts with those living in nearby Malibu a coalition was formed that had much more power…a common interest was found among these very diverse groups. An equally effective approach is to consider if there is another possibility in resolving whatever differences seem to exist. I am sure that each of us has experienced either taking a break or stepping back a bit from a problem to find that a new solution seems to appear. Our first speaker Lynne Twist utilizes such a new approach to fund raising. I can’t imagine that there was anyone in the room who was not inspired by her wisdom, enthusiasm and her willingness to be real with all of us. Lynne Twist is an activist, a teacher showing us a new paradigm around money, one of the most successful fund raisers for important causes (and we got a taste of her talent in this area mid-way through the morning session when she made an appeal for supporting Bioneers with a donation) and one of the “founded” of The Pachamama Alliance. When her talk began and she said that she was grateful to be here, you knew that was really her truth. I love that she allows her emotions full expression…her enthusiasm, her sadness and her hope. Rather than an appeal for money Lynne approaches fund raising as providing each of us an opportunity to be transformed and to be a part of transformation. She too is part of this transformation, in speaking of The Pachamama Alliance she calls herself one of the “founded” people, not one of the founders. The mission of The Pachamama Alliance “is to preserve the earth’s tropical rainforests by empowering the indigenous people who are its natural custodians and to contribute to the creation of a new global vision of equity and sustainability for all.” She spoke of the wisdom of the elders and asked us if our arrogance would doom us, preventing us from asking for help from the indigenous people around the world who have more answers to our modern-day problems than we might imagine. She reminded us that our liberation is bound with the liberation of others, that preserving the Amazon will preserve us as well. There are many solutions out there but we have only a small window of time to make the needed changes before we are faced with a new reality that we will not be able to reverse. ”The tide is turning but the status quo is moving faster than the tide is turning.” Teaming with other organizations, Lynne and The Pachamama Alliance have created a global media campaign called Four Years. Go. This campaign is “creating a global rallying cry to inspire an awareness of the urgency to shift humanity’s trajectory by 2014, before our destructive trends make that shift impossible. We are empowering individuals and organizations to set and reach goals that will cause a positive global tipping point by 2014, setting humanity on a new path toward a socially just, environmentally sustainable, and spiritually fulfilling future.” This is not one organization but an opportunity for many organizations, already 990 have signed on, to work together to create the changes required for a sustainable future for all of Earth’s inhabitants. There are lots of ways to get involved, you can check out how right here. The next four years are critical to the future of mankind and the earth. Many future scenario planners just see chaos ahead but we can transform this. Lynne reminded us that the Renaissance was only 25 years long and was guided by about 200 people, and created a revolutionary change. That was the time of Gutenberg and what an interesting parallel today with the potential for communication on a global scale. 1.7 billion people have access to computers and 4.1 billion can access a smartphone. We have an opportunity to create a new future and our choices in the next few years will decide what that future looks like. It is time to start imagining a positive future together, to start dreaming again what we would like the future to look like. Expanding on the significance of how we are connected Dr. john a. powell (this is not a typo but how he writes his name), Executive Director of the Kirwan Institute for the Study of Race and Ethnicity, spoke of the many ways that we are connected, both our inter-connections as well as intra-connections. When we join together, or merely casually interact, we change based on this contact. Everything that we come into contact with effects us from the buildings around us, to the food that we eat. We are beginning to experience just how much we are connected by larger actions, the labor market, the credit market, climate change…there is no getting away from feeling our interconnectedness, this is no longer just an abstract concept. Relationships are dynamic and multi-dimensional. In this dance of a fluctuating world all relationships matter and this is why social justice issues cannot be separated from other issues especially environmental ones…we need to consider what is our proper relationship with the “other” whether it is other people or the forest. We need to acknowledge, and I would add even embrace, our diversity because otherwise the tendency is to pull back and isolate, rather than looking at the larger picture (one of the ways to resolve differences). When we narrow our groups be they social, political, racial or ethnic it is more difficult to see our commonality and the differences can seem insurmountable. There is a greater need today to realize that right relationship is crucial for us to forge ahead with a society that is fair and just. This has important implications ethically, morally and socially. We need to turn our institutions around to reflect this right relationship. Is this not the crucial starting point for transformation, when we are correct with our neighbors on all levels, our communities and the larger global community we behave differently. It is time to acknowledge the importance of this and create a new paradigm recognizing how truly related we are and that we do impact each other, like it or not. The question is are we able to move forward in a fair and just manner or will we continue in a way that will endanger us all. In looking beyond our institutions and transformation did you know that for every two men who receive bachelor degrees, three women will; yet women represent only 18% of leadership positions in business, government and civic organizations. Gloria Feldt was our next speaker and she is part of that 18%. Her new book No Excuses: 9 Ways Women Can Change How We Think About Power was just released and she is no stranger to the challenges of utilizing power as a woman. Education in the US has now become equalized among men and women so what is the lag in leadership positions? Ms. Feldt’s book examines this issue and the remedies. She spoke to us about one of the cultural differences among men and women that contribute to this discrepancy and that is women’s tendency to avoid controversy. For many women controversy seems scary but in reality what we need to do is embrace controversy, to take the energy that controversy provides and use it to create our desired outcome. This can force us to look at and clarify the issues at hand and what we really believe. Controversy is a way to utilize power and keep a movement going, or bring attention to an important cause. She emphasized that it’s important to stay focused on the goal and to not just get caught up in the controversy. While this is important for all of us to recognize as an effective tool to bring about change it seems for women an internal transformation is needed to be more comfortable in the midst of controversy. There is a shift going on around us (but as Lynne Twist reminded us not quite fast enough) so maybe it should not be surprising that within higher education itself big steps are being taken to create a sustainable system. I have decided that Dr Tony Cortese is education’s sustainability conscience or at least an influential part of it. His talk gave me hope that even large institutions can change. He spoke of the pivotal time that we are in and that we must move from our exploitative mindset, which we have always had, to one that is healthy and fosters a just society. This shift is in everyone’s long term interests, but we cannot get there without a change in consciousness, and mindset changes begin with education. Higher education is a critical place to be an example of this shift since this is where most future leaders will come from. What would higher education look like with new goals in mind and how would it change what we have been doing for decades? Universities and the education that students receive must be more practical and experiential. As colleges integrate themselves in the community students gain real life learning, not just theoretical knowledge. There is tremendous engagement on campuses across the country today. Often students when considering what college or university to attend look at the school’s sustainability policies as part of their selection criteria. Many new majors around sustainability have been created in a myriad of fields from law to the arts. This is our future green work force and students seem to recognize that this is far beyond just an environmental issue but that it is an issue of humanity. 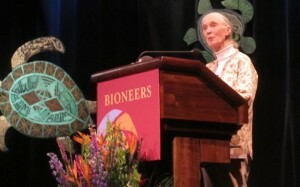 Our final speaker was Dr. Jane Goodall, Dr. Jane as she refers to herself. If she is an example of what we get by following our dreams and staying committed then we all should jump to action in what thrills our heart. A woman of light and power, of strength and deep compassion. She shared with us her power infusing it in all of us assuring us that “every single one of us makes a difference every single day”. Most of us know her story and if you don’t you can read about her and the Jane Goodall Institute here. “The Jane Goodall Institute works to protect the famous chimpanzees of Gombe National Park in Tanzania, but recognizes this can’t be accomplished without a holistic approach that addresses the real needs of local people. Our conservation efforts include sustainable development programs that engage communities as true partners.” I was happy to hear that the institute also addresses the issue of overpopulation, an often taboo subject it seems, recognizing that much of the changing forest in Tanzania and other places is the direct result of population growth. In addition to the Institute Dr. Jane has created a global youth organization called Roots & Shoots. This was started to provide youth around the world an outlet to express themselves and transform their feelings of hopelessness, anger and powerlessness into action. The organization is now in 120 countries, from pre-school to colleges and even in prisons and senior citizen centers. Everyone gets to choose what their project will be, what speaks to them personally, helping animals, people in the community or the environment. Once again we heard about the power of action rather than just learning from books. When we come together our spiritual fuel to continue is found. The power of Roots & Shoots is that if a small seed can break through concrete so can we as the human race breakthrough. As the final plenary session came to a close I had a feeling that this breakthrough is entirely possible and we are actually in the midst of it. So many projects and organizations creating transformation around the world so that we all can have a better future. Will we make it? Can we make this shift before we allow changes to take place that cannot be undone…it is possible if we join together and take action. As Dr. Jane told us “there is hope as long as the human brain is linked to the heart.” Let’s all remember this and allow our hearts to guide our actions to create a better, just and fair future for all of us who inhabit this beautiful planet called Earth…it is truly in our hands.